A natural gas explosion leveled a house and damaged an exposure shortly before noon at 2433 S. Queen Street in the Spry section of the township. First due Station 19 (Goodwill-York Twp) arrived to a chaotic scene with heavy fire and smoke conditions and reports of entrapment in the collapsed dwelling. 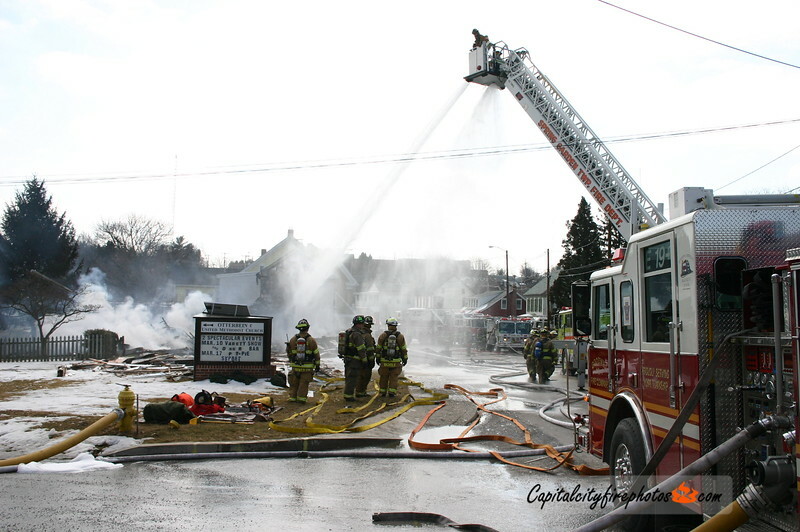 2nd and 3rd alarms were quickly struck along with York County ATR. Companies set up exterior ops on the fire building that had completely collapsed and began an interior attack on the exposure which suffered from the blast and ensuing fire. Other companies went door to door checking residences for traces of natural gas. Several homes and businesses were evacuated as high traces of natural gas were present. The fire was brought under control in about 45 minutes but crews remained on the scene for several more hours. No occupants or firefighters were hurt from the blast or fire but a motorist driving a GMC Suburban, who was passing by the location at the time of the explosion, had windows blown out showering the occupant with glass.